Sizes 1/2", 3/4", 1", 1 1/4"
Controls up to 25 psi. Automatically maintains desired pressure in a line or system by discharging excess pressure to the atmosphere or to a lower pressure system. All bronze, neoprene-nylon diaphragm, composition disc, sensitive adjusting spring. On installation, a "T" is placed in the inlet line and a sensing connection is run from it to the top of the valve. Applications Centrifugal, regenerative turbine, reciprocating or rotary pump bypass valve. Protects pump systems from over pressure. Protects against periodic high pressures; maintains a desired inlet pressure by relieving to a lower variable pressure, or to atmosphere. Relieves dependably at adjusted pressures; shuts tight after relieving. Features unique "Floating Ring" seating arrangement that produces perfect seat contact. The FR valves afford unusually close regulation, repeatability of opening pressure and close reseating pressures.The FR-10 is for more economical, lower pressure applications - maximum pressure setting 250 psi. (Provided with iron body and spring housing only). Type FR is available in iron, bronze, steel or stainless steel body; threaded connections; monel, stainless steel or BUNA-N diaphragm. Pressure settings from 0 to 400 psi. The FR-6 is available for 200 to 600 psi. Applications For service on liquids, air and gases that are not corrosive to bronze. Recommended for bypass regulation on fuel oil systems, compressor governor pilot control, and many small to medium pumping system bypass jobs. Ideally suited for many applications in the cryogenic field. Automatically maintains a constant inlet or back pressure. Functions as a pressure limiting regulator, not as a safety device. Bronze body, stainless steel seat ring and disc. Type FRM-C is a soft-seated version of Type FRM. The Type FRM-2 is designed with larger physical dimensions and internal seat opening providing greater capacity. Type FRM-2 is also suitable for fuel oils and lube oils. Applications Suitable for pump systems of all kinds. Applicable on water, other fluids and especially oils of all grades. 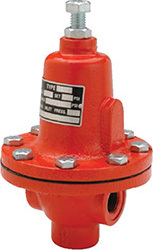 Sizes 1", 1 1/4", 1 1/2", 2"
High-capacity valves. For flow up to 200 gallons per minute in the larger sizes. Bronze body and trim, threaded connections, bottom and side female connections, brass spring chamber, stainless steel adjusting spring, high temperature gaskets. K-5 has a metal seat. K-5C has a soft seat for tight shut-off. Relief pressures range from 5 to 150 psi. Applications For water, other liquids, and light fuel oils. Not for steam. Designed to limit a specific pump discharge pressure on machine tool hydraulic systems, oil burning equipment, rams, presses, lifts, etc. Sizes 1/4", 3/8", 1/2", 3/4", 1", 11/4"
Bronze angle body, stainless steel trim, threaded connections, single metal-to-metal seat only, bottom female inlet, side female outlet. Relief pressure ranges from 15 to 600 psi. Maximum temperature is 450°F (232°C). Applications Suited for by-pass applications on high pressure pumps or any system requiring automatic regulation of pump discharge pressure. Many applications in the chemical and process field (waste treatment desalination) and car washes. Sizes 1/4", 3/8", 1/2", 3/4"
Angle type by-pass valve handles high pressure up to 1500 psi in brass body. Threaded connections. Maximum temperature 450°F (232°C). Applications Suitable for air or water service. Sizes 1", 11/4", 11/2", 2"
Offers high-capacity, extremely accurate control. Main valve features brass construction, BUNA-N diaphragm and seat disc, stainless steel spring. Pilot is brass with stainless steel spring, seat disc and seat ring; bronze diaphragms for air service or neoprene diaphragms for water. Pressure setting 15 to 200 psi. Applications For water, oil, and other fluids. 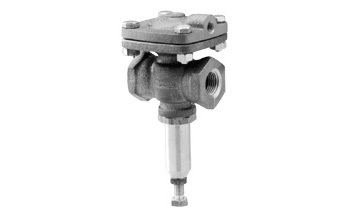 Small, economical bypass valve for pressure control of a less critical nature. Bronze body, stainless steel ball seat. Metal-to-metal seat - does not close off drip tight. Leak-proof cover cap and gasket. Male inlet, female side outlet. Pressure ranges 10 to 250 psi. Applications An inexpensive solution to installations requiring frequent changes in the set point. Designed for bypass and overpressure protection in pumping systems such as weed sprayers, etc. that are non-corrosive to bronze. Bronze body, BUNA-N disc and stainless steel spring. One of three pressure springs is used, providing an adjustable range of 10 to 60 lbs., 0 to 125 lbs., or 20 to 200 lbs. Male inlet, female outlet. Applications Types CP and CP-2 are used as pilot valves in rotary screw compressors to control receiver pressure or compressor discharge pressure. The pilot valves provide a regulated output pressure that increases on a desired ratio to provide input pressure to the air intake valve. Benefits of the Types CP and CP-2 are savings in energy, quieter Compressor operation, and reduced wear. Bronze body, bronze trim, with stainless steel seat ring and disc. Maximum Controlled pressure of 400 psig.